Gobble started with a simple mission: to create simple, delicious meals for the entire family. 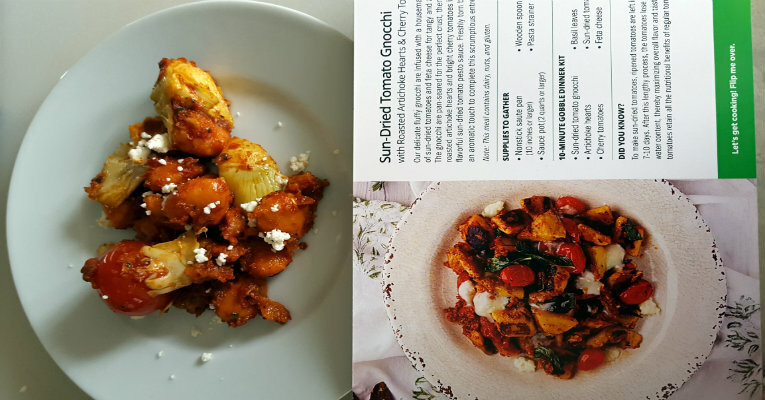 Their 10-minute, one-pan meals set them apart from the other dinner kit options out there – and they are one of the few that accommodate busy working lifestyles and family schedules alike. 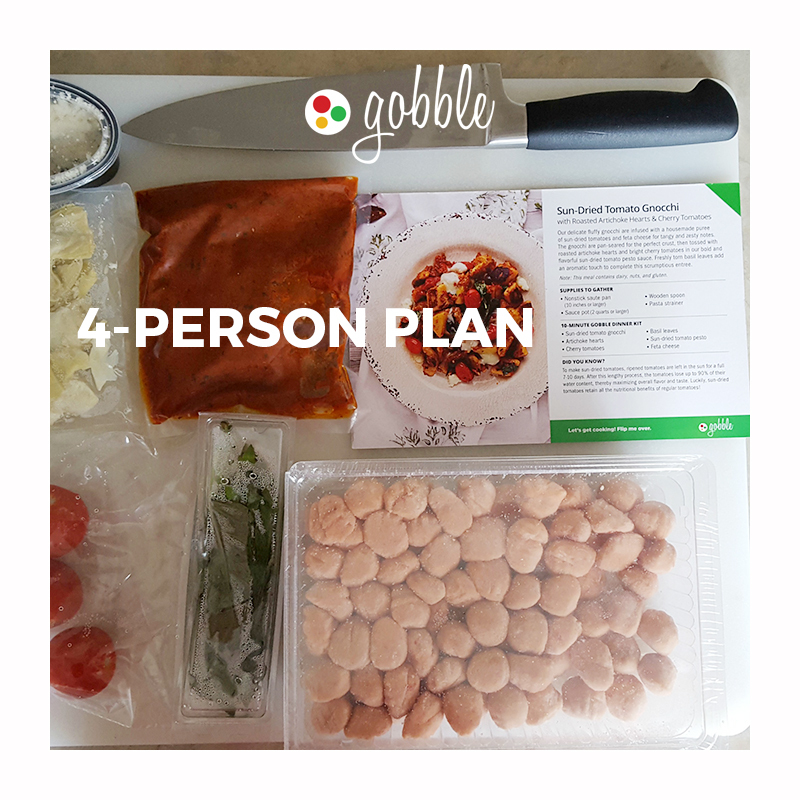 With Gobble, you don’t have to shop, meal plan or do much prep. Most of it is ready to hit the pan and in 10 minutes you’re ready to eat. A dinner kit that focuses on 10-minute, one-pan meals. Gobble offers free shipping and no tax for all boxes. 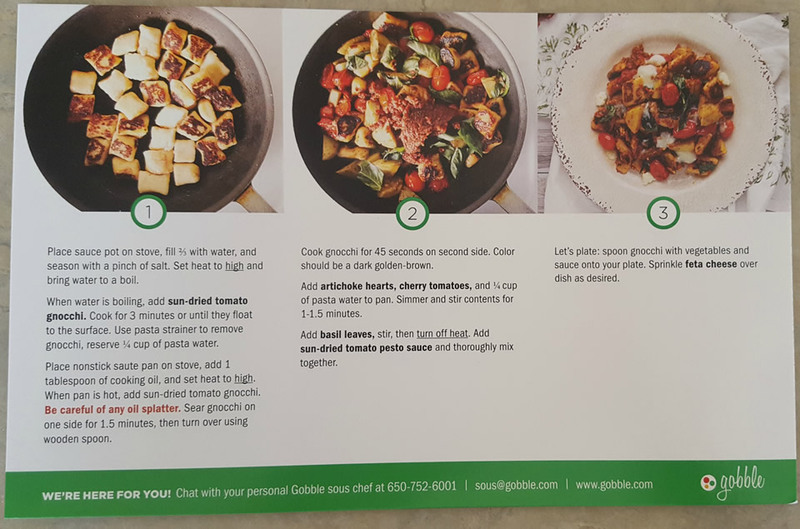 With Gobble, each week you are allowed to pick three meals with two to as many as four servings per meal. You can choose between vegetarian, meat dishes and even gluten-free. Their curated menu options vary from week-to-week and you will get anywhere from six or more meals to choose from. Gobble does try to appeal to all specialty diets. 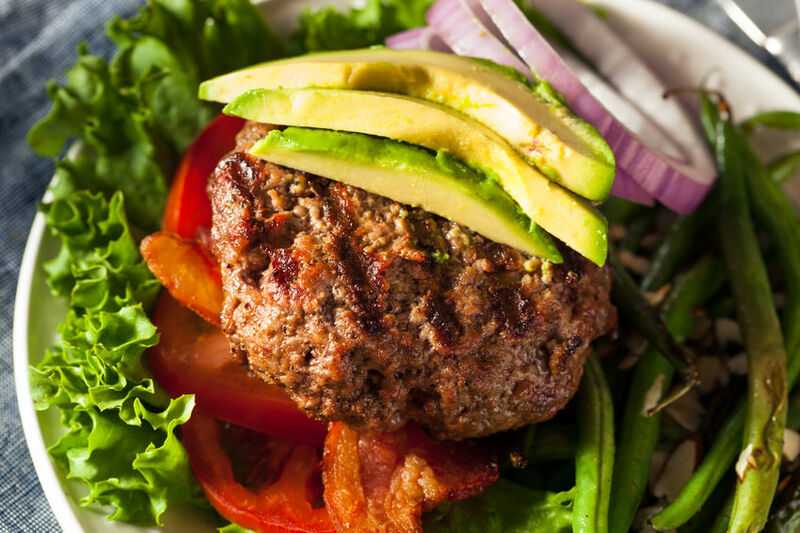 They offer everything from vegetarian and vegan to dairy-free, gluten-free, and even low-calorie meals. Gobble asks you what you want to eat each week – such as a little of everything, vegetarian only or even low calorie. Then, they automatically pick three meals for you for that week. 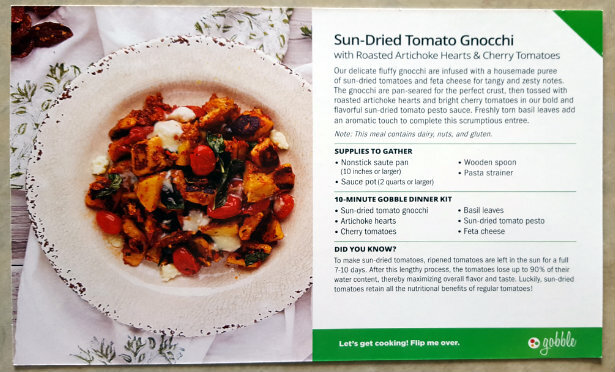 Gobble does have a few unique add-ons – something not all dinner kit services offer. For example, the week I was ordering you could add a cucumber rosemary margarita mix – perfect for summer. You could also tack on cookie doughs and lemonade mixes. These are charged at a different rate per serving – averaging $1.95 per serving. It’s a cool feature, especially if you’re in the mood for something new or just want to complete the meal with dessert. Gobble doesn’t have as many meals to choose from each week. The most I have seen so far is about six recipes – with a three recipe per week maximum. Also, you are stuck with only two or four servings per meal. This may be too limiting for those that want three servings or need something more robust like five to six servings. 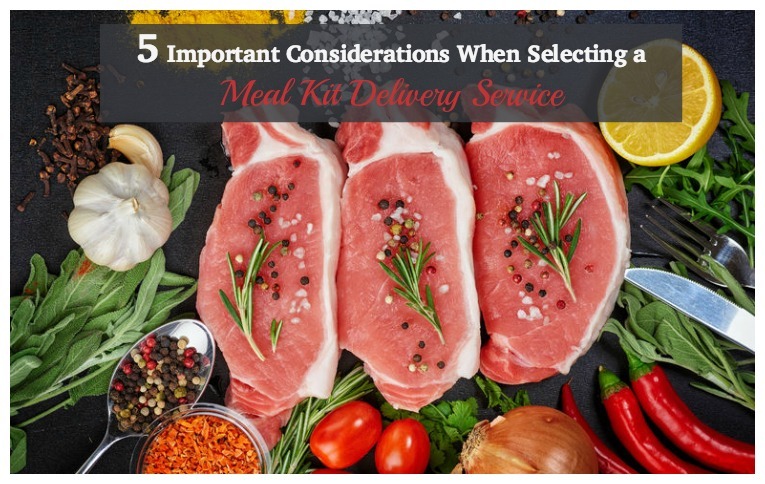 They are flexible with ordering initially, but after the first week, you are required to order a minimum of four meals or you cannot participate. Minimums, in our opinion, stifle a shopper’s options – especially if they don't find that many meals appeal to them for the week. While Gobble does accommodate special dietary considerations, you should note that they don’t offer a meal for each of those each week. 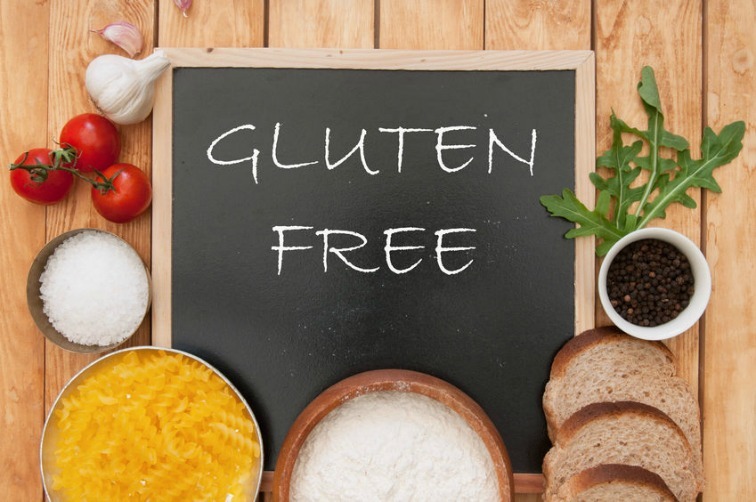 So, if you’re on a gluten-free diet, you may not have tons of options or any options for that matter. 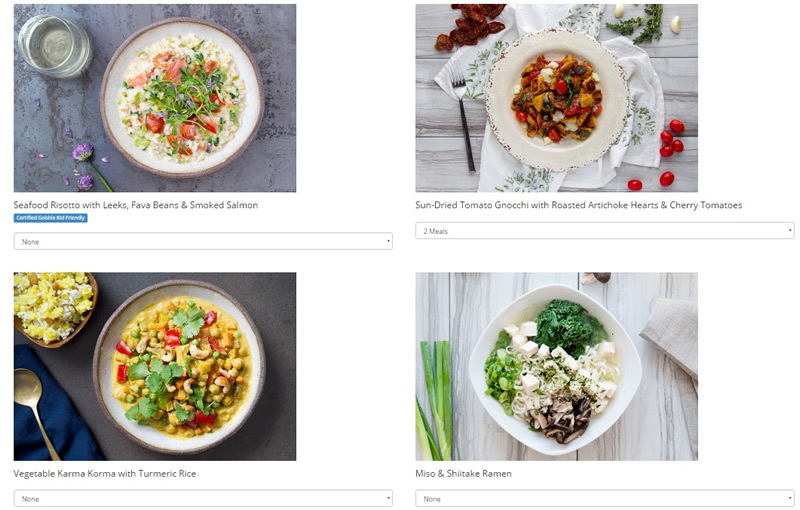 Each week, Gobble automatically picks three meals based on your taste preferences. 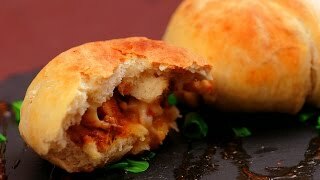 If you don’t like them, you can go back and pick different options, double up on a single recipe or just skip the week. There are no combination limits with Gobble, which is always refreshing. 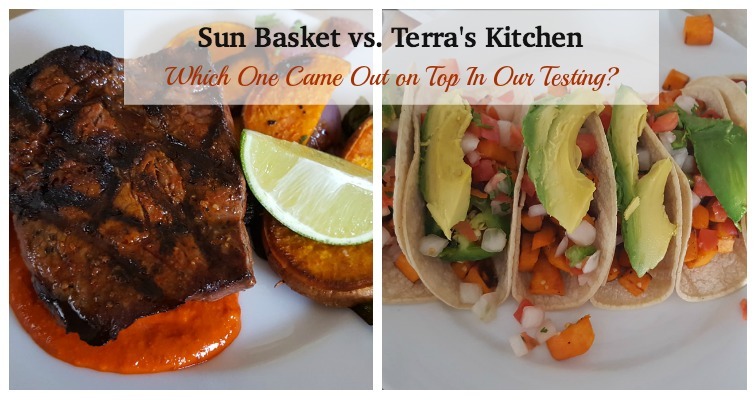 You can pick and choose any of the three recipes you want – but I suggest you hurry. It seems they run out quick. The only issue I have with Gobble’s flexibility is the limited number of recipes to choose from. 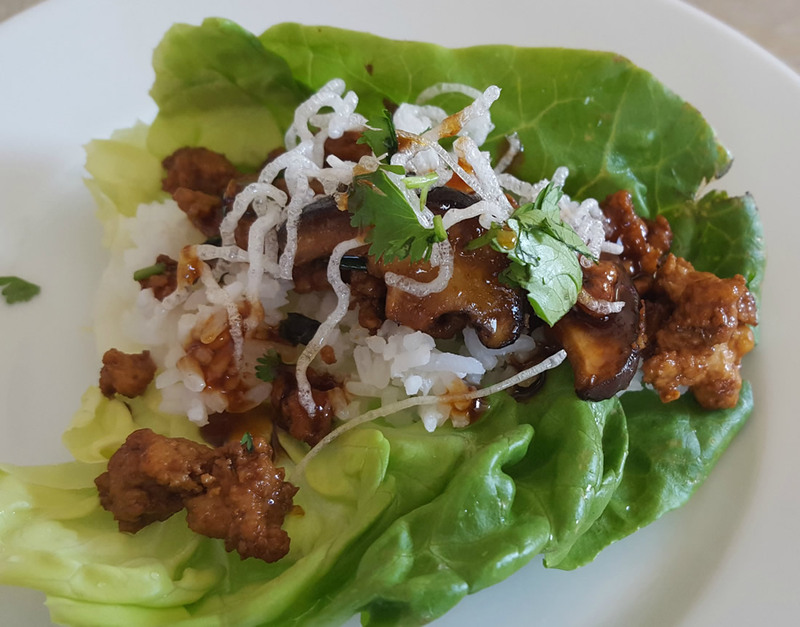 It was hard to pick three recipes for my week and I ended up skipping one week and waiting for the next – because the six recipes for the first week were just unappealing. 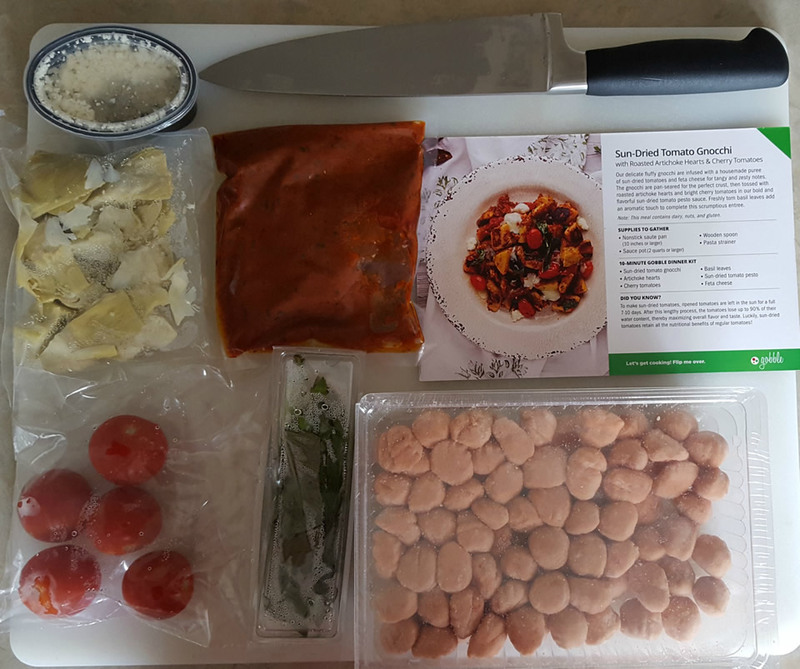 Each week, the recipes are varied and none are exactly alike – so you do get a good mix each week. 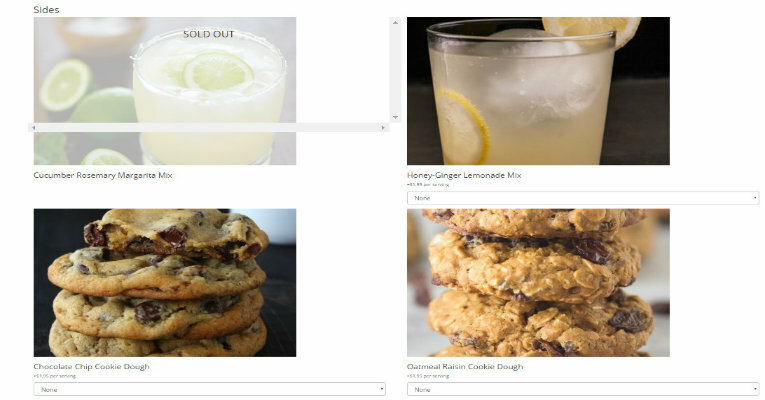 I like that you can click on each recipe and read all of the ingredients you will receive, a description about the recipe and even read if it is dairy, gluten or nut-free – so you can pick recipes based on your dietary preferences. Overall, they do encourage experimentation, but don’t force you into some extremely odd dishes that may not work for the entire family. Because Gobble is more ideal for families and busy adults, they try to give you a mix of familiar and out-of-the-box. They even label their meals “Certified Gobble Kid Friendly” so you can pick family-friendly meals. Gobble does make it easy to skip weekly meals – while there are companies out there that make it extremely complicated. All you need to do is tell them before your next processing date and then let them know why you’re skipping. Most companies don’t require as much info as to why, but Gobble uses this information to improve their products and recipe varieties to keep people interested. The recipe descriptions online are amazing. They sound so unique, flavorful and mouthwatering. But, unfortunately, the end result is not as great. 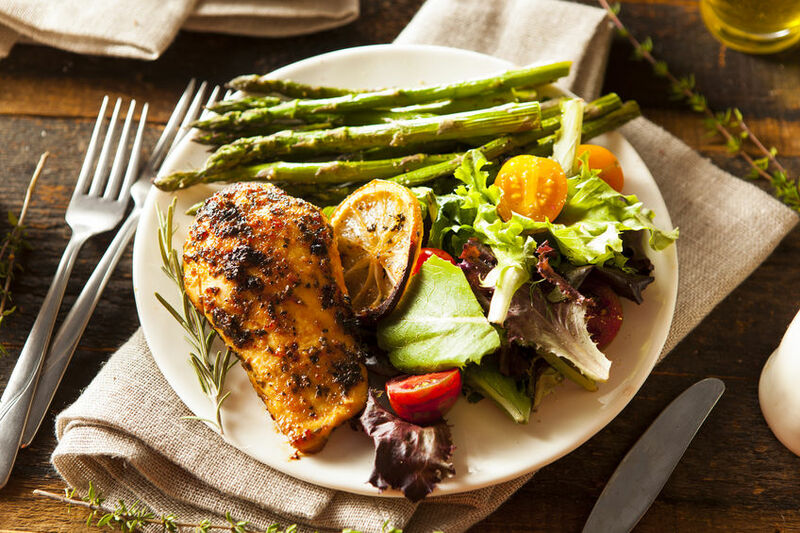 Gobble states on their website that the average calorie count for their meals is 500 to 700 calories per serving. 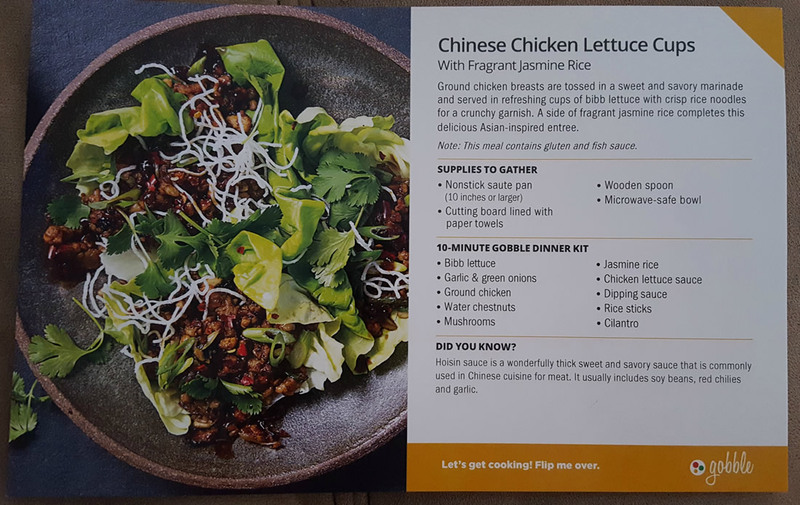 This is great for those looking to keep their calorie counts low and is about average compared to other dinner kit services. 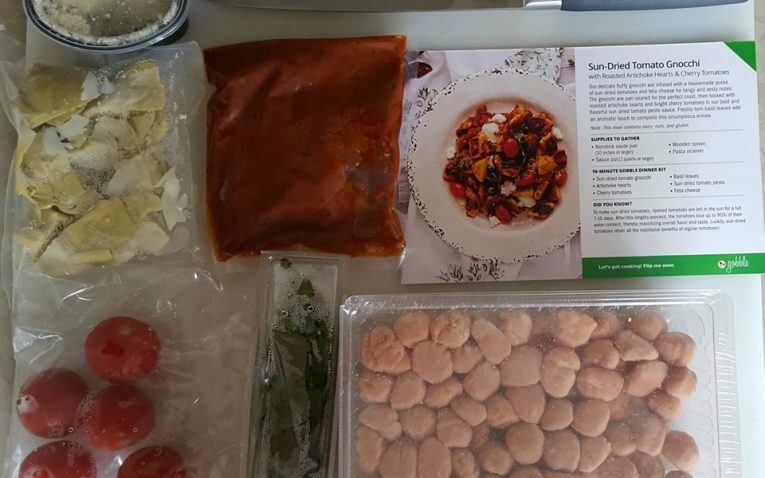 Most of the ingredients were fresh and there weren’t any issues in terms of quality for a majority of the box contents. 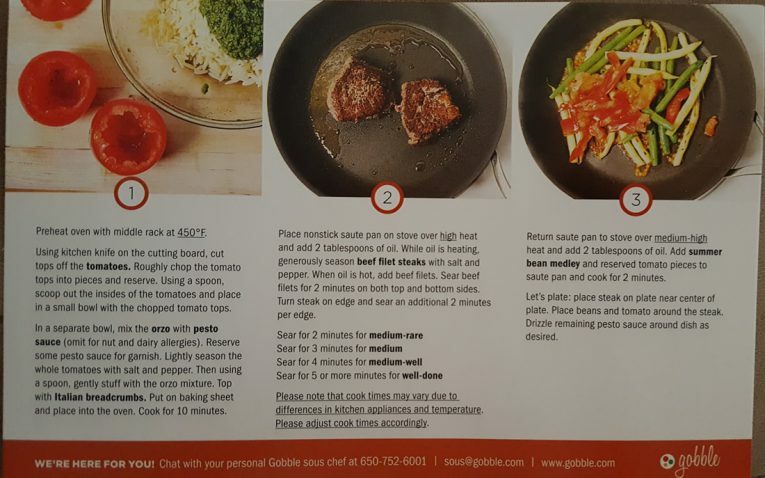 Gobble says on their site that calorie counts are 500 to 700 calories per, but nowhere on the recipe cards do they give you nutritional information about what you’re eating. No calorie count, salt, protein, etc. This is unfortunate – because most people would like to know the calories of what they’re eating. A few of my ingredients were less than fresh. In fact, the basil for one recipe was soggy and wilted – not exactly appealing. Gobble doesn’t tell you where they source their products from – which is another drawback. 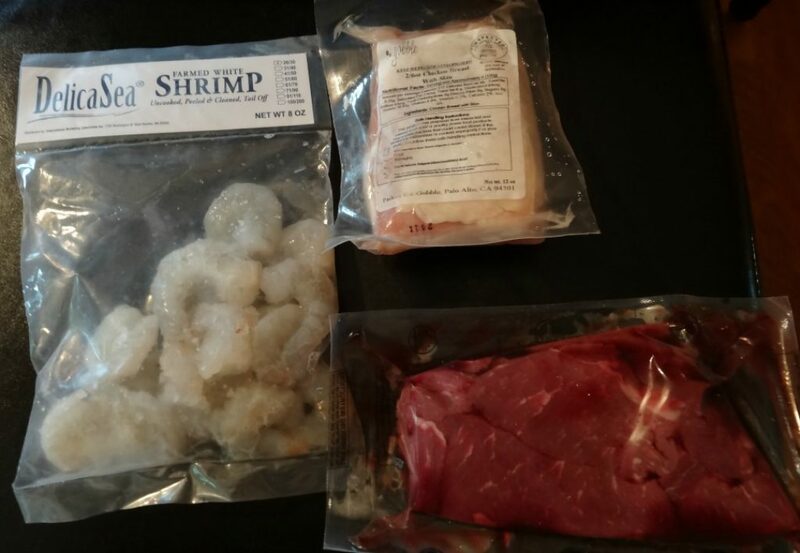 Most dinner kit services make it clear where their foods come from and even highlight vendors on their site. Hopefully, Gobble can add this in the future. 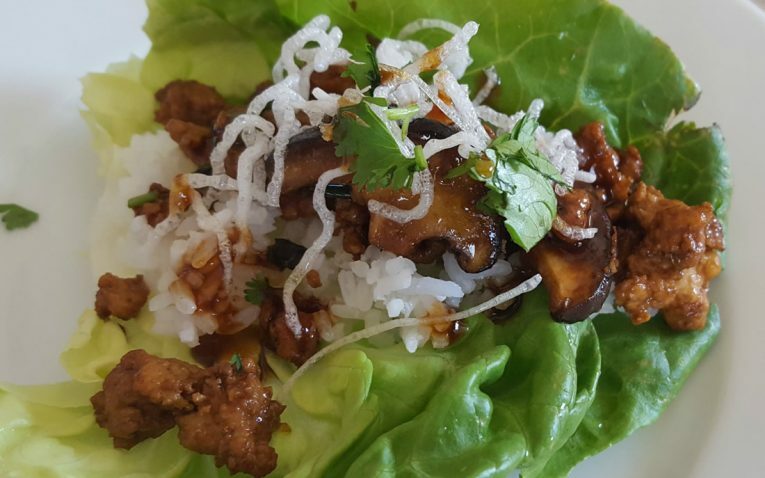 Gobble has a flat rate for meals – so it doesn’t vary depending on the meal style you choose. They also have flat shipping. 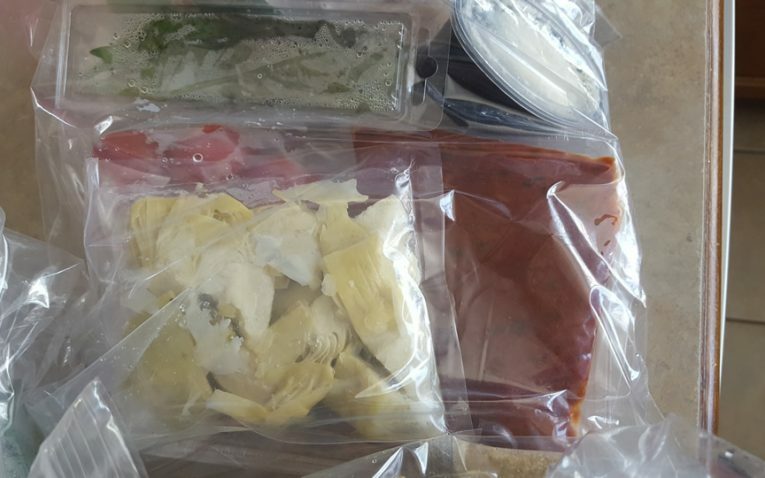 Unfortunately, Gobble is one of the priciest meal delivery kits we’ve seen. While they offer the convenience of a flat fee, that flat fee goes from $11.95 per serving to $13.95 per serving. You will pay $11.95 per serving if you order six or more meals per week. If not, you will pay $13.95 per meal for four meals per week. This is by far more expensive than the competition – almost $2 to $3 more per person. 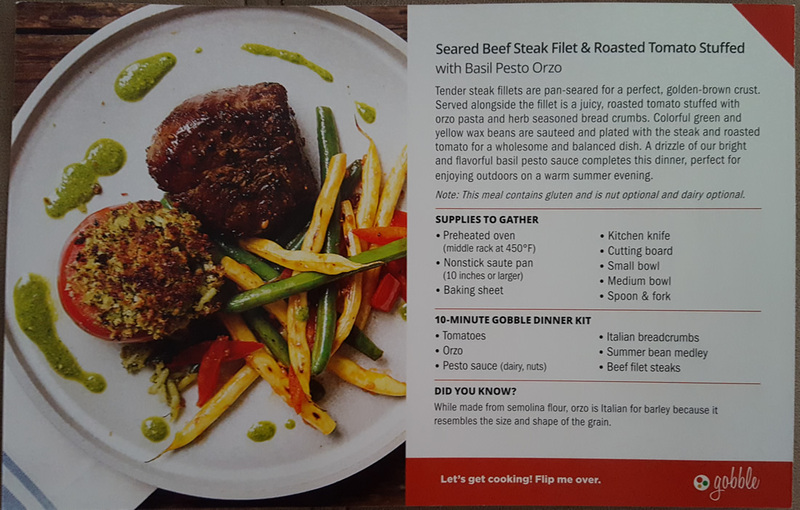 Gobble sends you promotions and emails about free meal kits and discounts. I gladly went to use a coupon code and none of them worked. I kept getting failures – even on coupon codes I received that same day! This is fairly disappointing because they use these coupons as an incentive, but instead, I had to pay full price. While it may be a glitch, a company should not send coupon codes that don’t work. 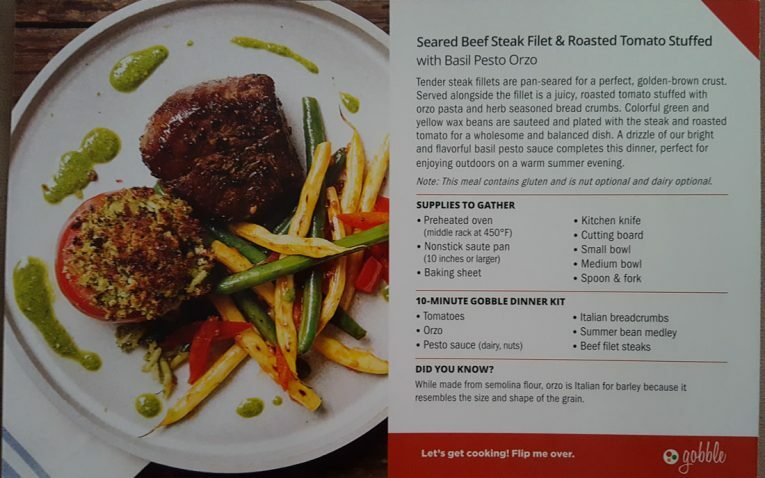 Read our taste test of the recipes and food from Gobble here. 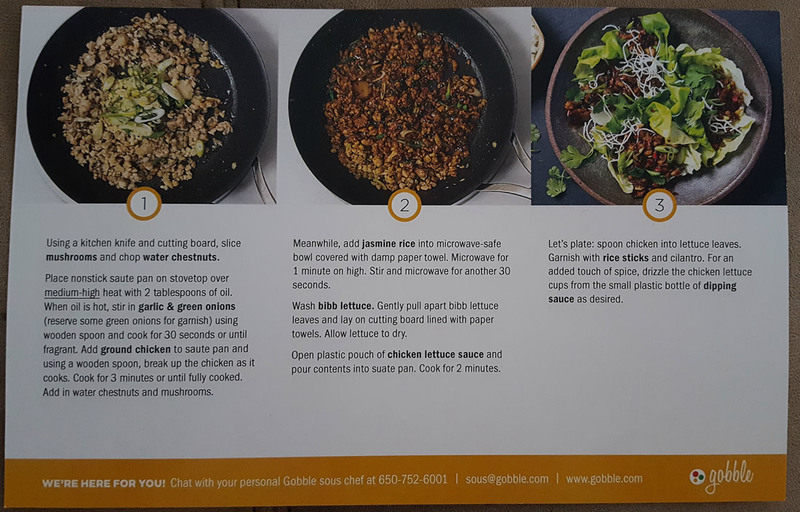 Gobble does offer a lot of creative recipes that all promise to be ready to eat in 10 minutes and using just one pan – which is always a bonus. They do have clear instructions – and all of their recipes are three steps to completion. The only issue is that they combine multiple steps into that first, second and third step. But, they do separate them and bold/highlight wording that is important. Recipes are super simple to complete. In fact, there’s little to no chopping. Everything is already pre-chopped, bagged and basically ready to pour into the pan. 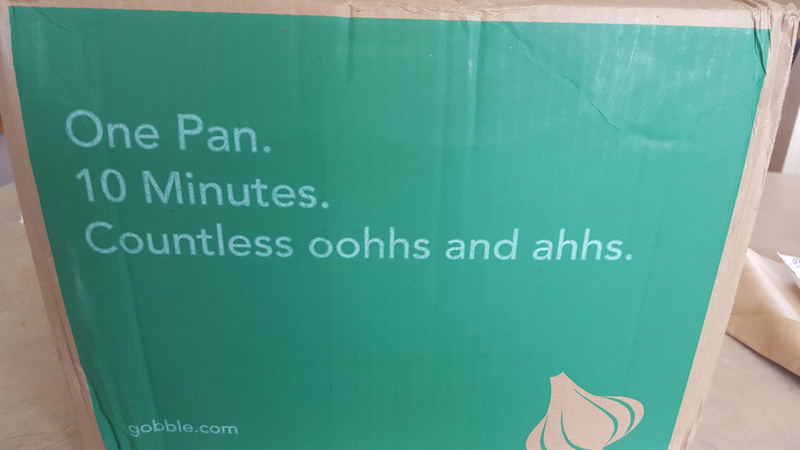 I was not impressed with the recipes from Gobble. While they were true to the 10 minutes, I had quite a few issues with their recipes – including how they just did not taste great what-so-ever. In fact, out of the three recipes, I’d only repeat one, but not for the price they’re asking for. Pretty much every recipe turned out way different than the picture – other than the lettuce wraps. 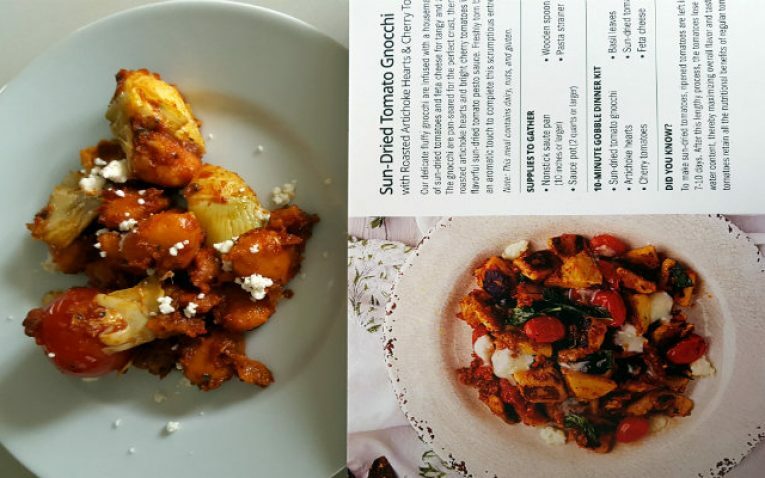 One looked like mush and wasn’t even the same color as the picture, another was MUCH smaller than what the recipe card made it look like. While the recipes were easy to use, I have a huge pet peeve with typos. These recipes are supposed to be pro-inspired and created for the novice chef. 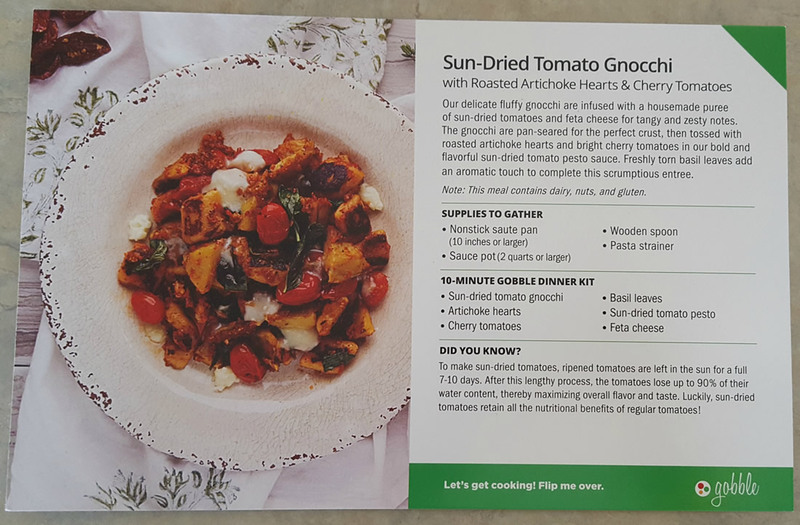 Typos have no place on these recipe cards. I found a few instances where there were typos – thus, why I had to point it out. Curious how it all turned out? 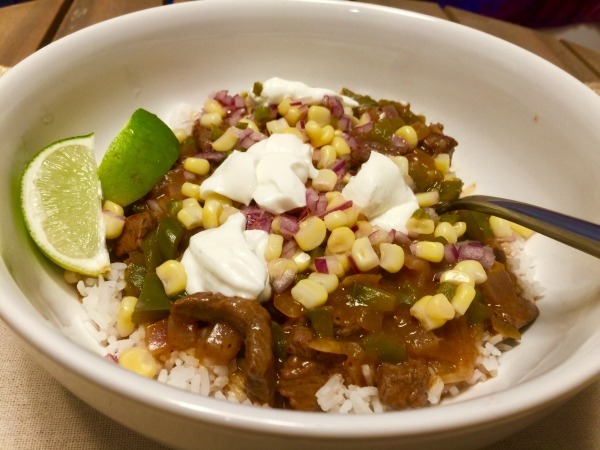 Read our taste-test blog for Gobble’s food and recipes. Gobble tries to limit waste by using things like box liners that are filled with recycled cotton so they are 100% compostable & food safe, to keep items cold. This is fairly nifty. These new box lines replace their old jute liners that gave off a rather unpleasant odor. Great improvement! Gobble sends you an email when your item is on its way so that you know to expect it. The exterior of the box is clearly labeled, so you know who it comes from. 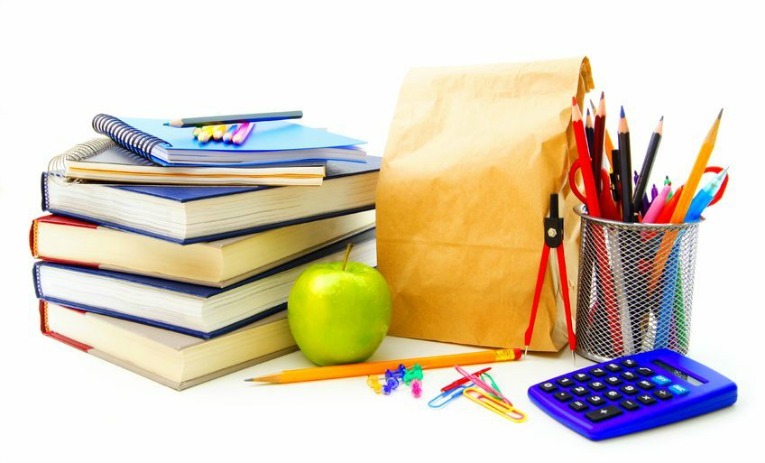 While this might not seem like a big deal it is – you want to know what you’re receiving. 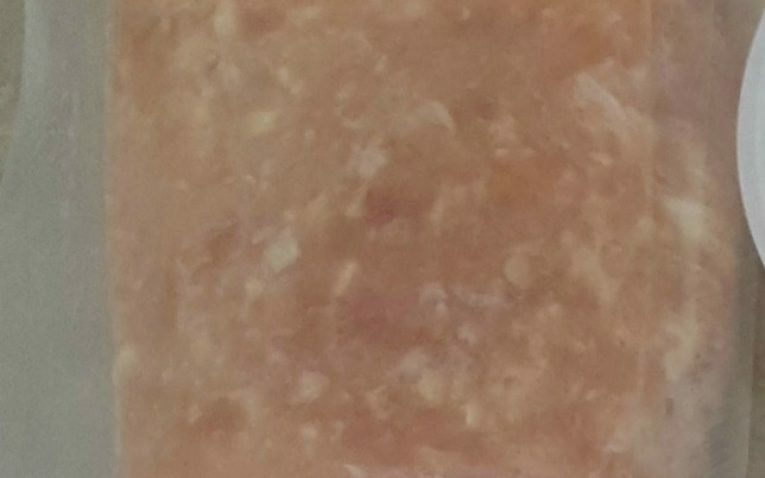 You don’t have to guess what is what. 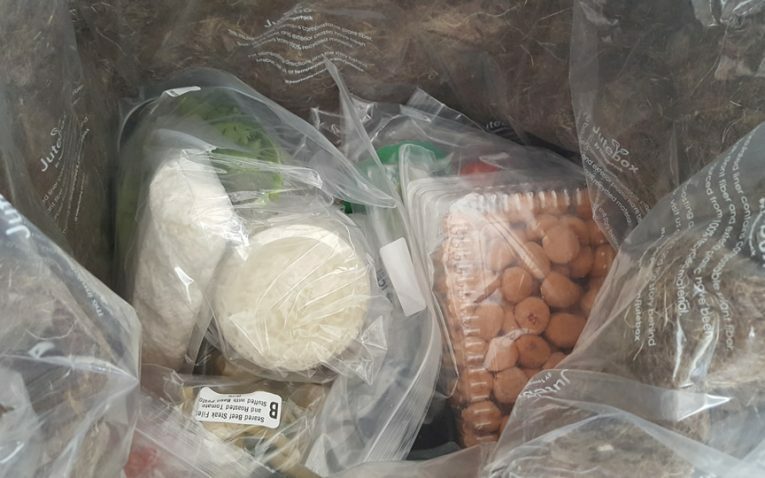 Gobble clearly marks each bag and places all of the ingredients for each recipe into a separate bag – so you can just pop them in and out of the fridge. 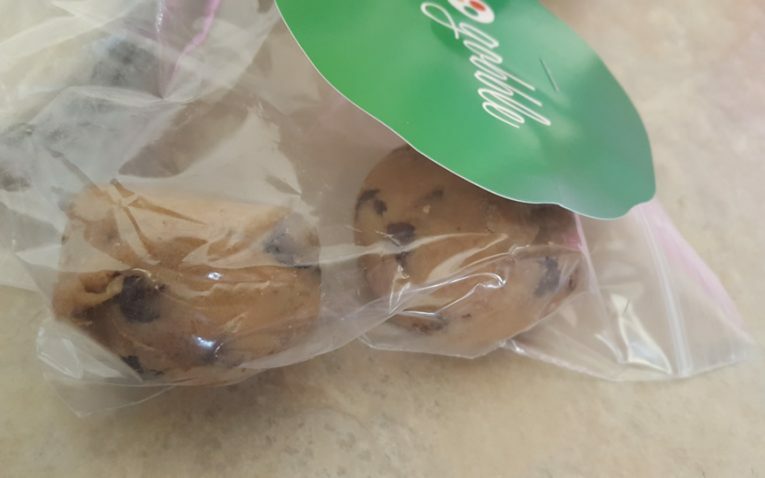 With Gobble, everything is put into a plastic bag for each meal. Unfortunately, in our first shipment there was no strategic placement – and if there was, everything shifted drastically in transit. A lot of items that needed to remain cold were at the top of the box – and definitely not 40 degrees Fahrenheit or less. As you can see upon my opening, cheeses were sitting at the top of the box instead of facing bottom (where the cold packs were). 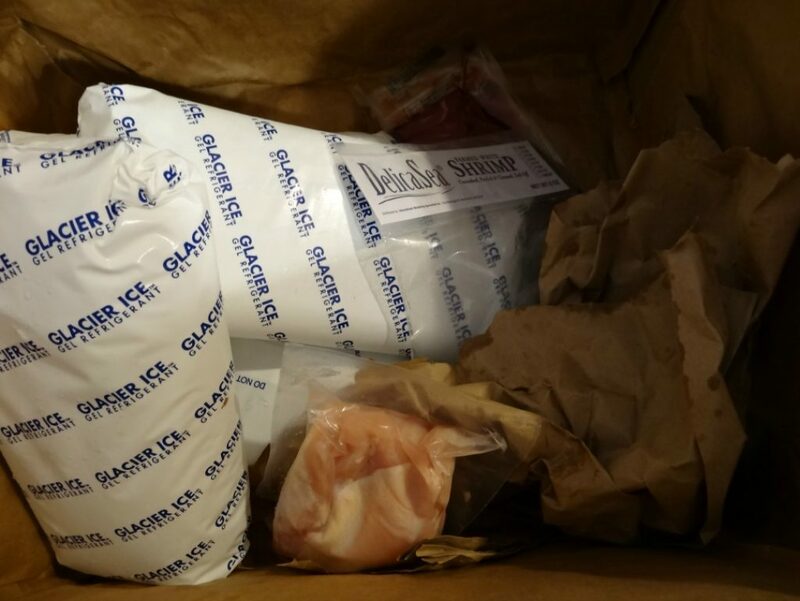 In our second shipment, however all items were kept cold, even though we still had things like heavy cream at the top of the box – this time there was an ice pack at the top of the box keeping things much colder. The various layers of delicate produce ingredient items and meat were separated and cushioned by layers of brown paper. 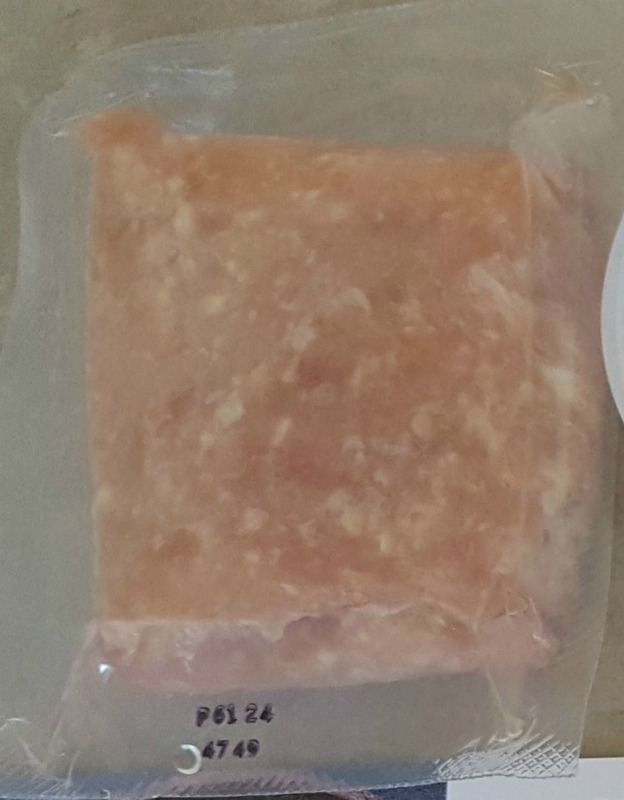 All of the meats are packaged at the bottom of the Gobble box, but there are only labels on some of the meats. 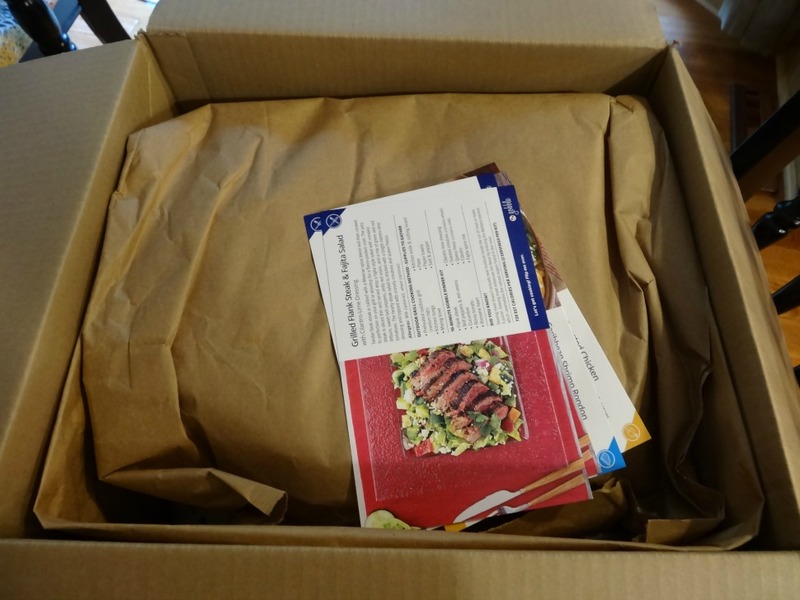 While my recipe combinations made it easy to decipher which package was for what, had they been similar or had I had two beef recipes, it sure would have been difficult. Also, I like to know where my meat products come from. 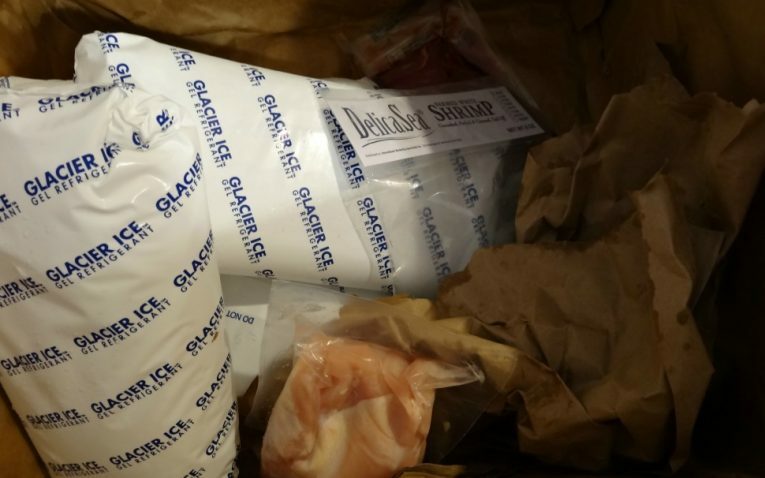 Lastly, in our initial test shipment, due to their haphazard packaging, one of my beef filets leaked all over the bottom of the box – including my other meats. This is why we'd love to see Gobble put each meat into another zip style plastic bag to help limit cross-contamination from leaky meat packs. It was also warm to the touch and shoved off to the side of the box. 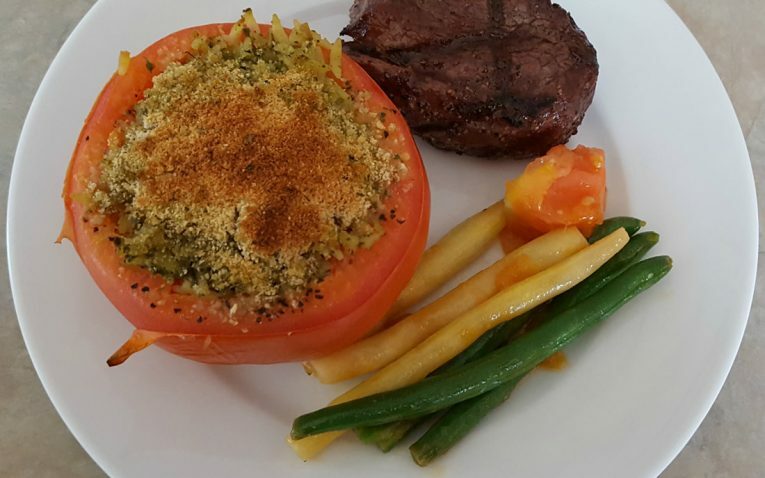 I had to discard it – leaving one of my meals short a steak. a carton of heavy cream. We had a grand total of four ice packs in this shipment. 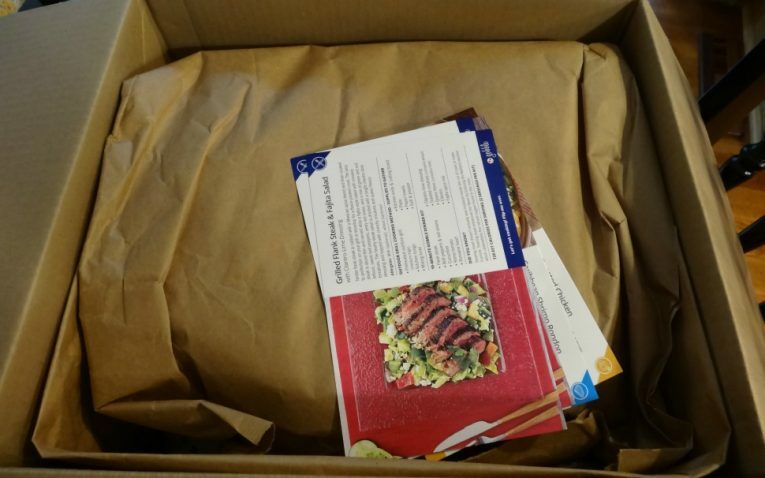 Your meals are shipped once per week for the entire week. You can choose your delivery day and even adjust it in the taste preferences section. Right now, Gobble offers Tuesdays, Wednesdays and Thursdays for designated delivery days. Shipments are received at your house between 8am and 8pm. You do not need to be home to sign for the box; and Gobble promises it can sit on your porch until you get home that evening to receive it (no later than 9pm that day). Instead of charging shipping, Gobble incorporates shipping into their flat rate. But, that means you won’t pay shipping even if you order the minimum meal count per week – something other companies usually charge for. Gobble also delivers during the summer. While Gobble is working to expand their shipping capabilities, they currently only ship to California, Nevada, Washington, Oregon, Arizona, Idaho and Utah. They do hope to expand soon. Gobble lets you choose between their two meal kits or you can create a customized gift card amount – giving you a lot of flexibility. Also, since you are just purchasing one week of food (for either two or four people and three meals total), you are not stuck honoring a contract. Instead, your gift recipient would simply enter the gift card information as payment and then continue with their week-to-week service. You can email your gift card to the recipient as well – which makes it a lot easier to deliver. 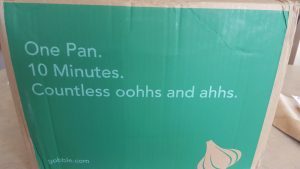 I emailed customer service regarding an issue with my Gobble box. It took them several days to respond, but the did refund my account the entire amount of the box. Gobble does have a freshness and refund guarantee. If you have any issues with their food, you can contact them and they will do what they can to make it right. Gobble is available via email, social media and phone for issues. They state they will respond within 24 hours to emailed issues. I had an issue with the Gobble box I received – not only was I missing a tomato for one recipe, but one steak filet has broken open, leaked all over the box and was warm to the touch; therefore, I discarded it. I emailed the company immediately – on June 8th. I did not receive a response from customer service until June 15th! This is fairly disappointing. While their response was helpful, the fact it took so long to respond is upsetting. Their site says that someone will respond in 24 hours to any issues – but my response took 7 days. 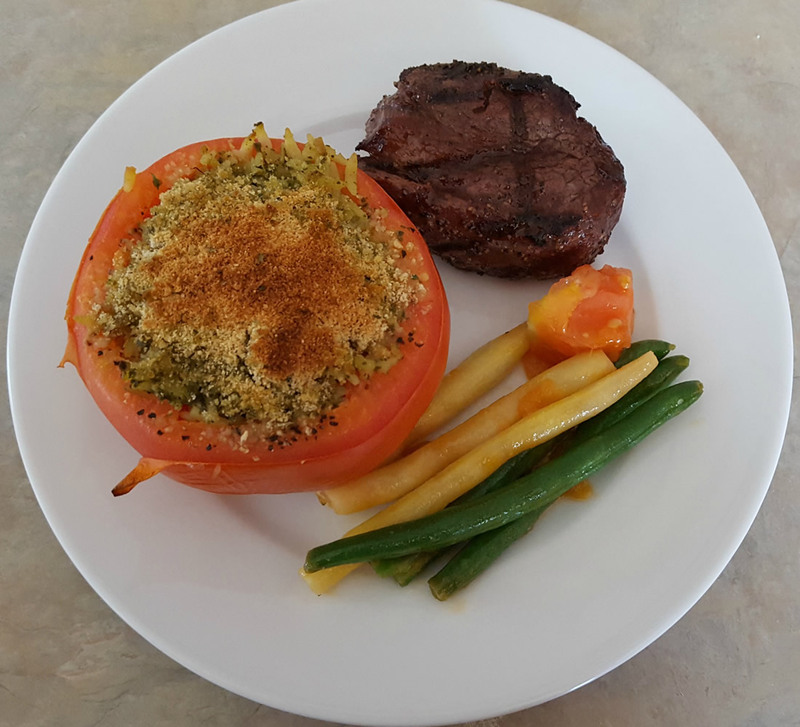 Also, my kit was missing a tomato for the stuffed tomatoes – driving the meal down to only one full serving instead of two. 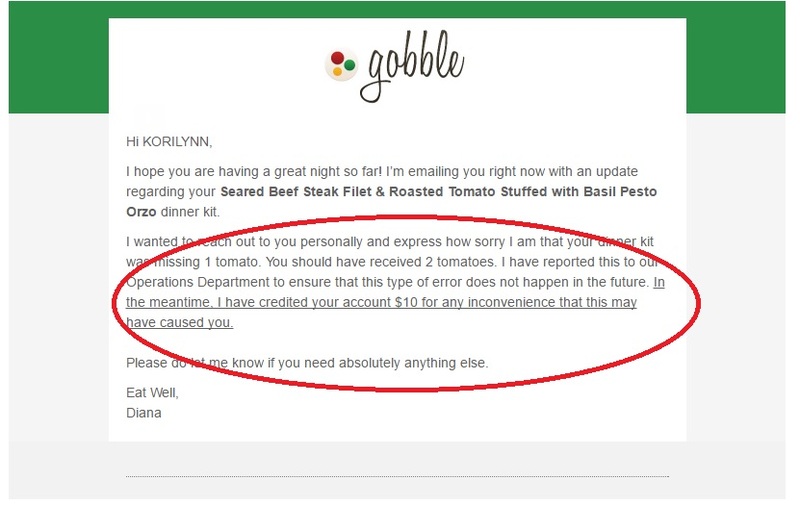 I received a general email from Gobble – which they sent to all customers – stating that they realized they shorted their boxes a tomato and their apologies, but they offered only $10. This is less than the cost of a meal serving. 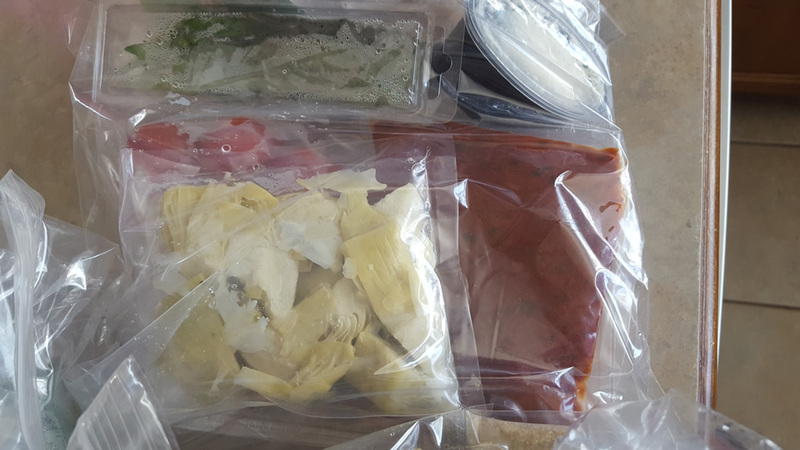 While it more than makes up for the cost of replacing a tomato, the entire purpose of these dinner kits is the convenience of having everything delivered to me – so I don’t have to shop or meal plan. So, not being reimbursed the entire cost of a single meal (which was incomplete due to no tomato), is disappointing. 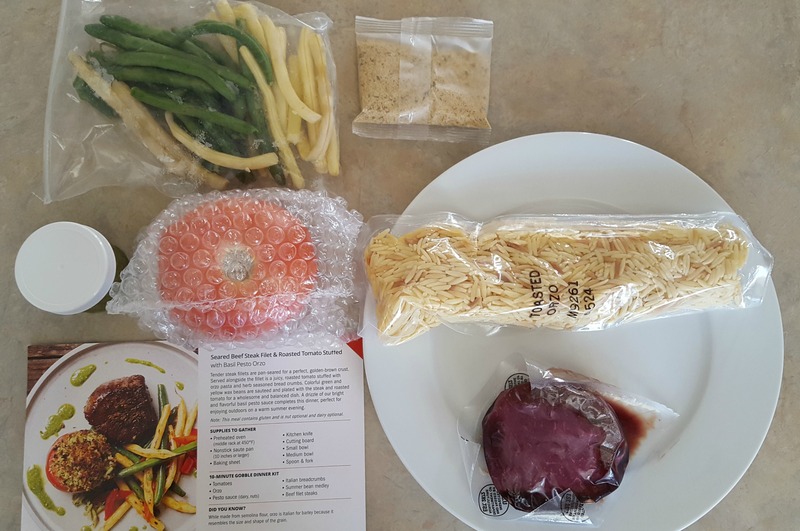 Dinner Kit A: Includes three dinner kits for two people (six meals total per week). Starts at $11.95 per serving. 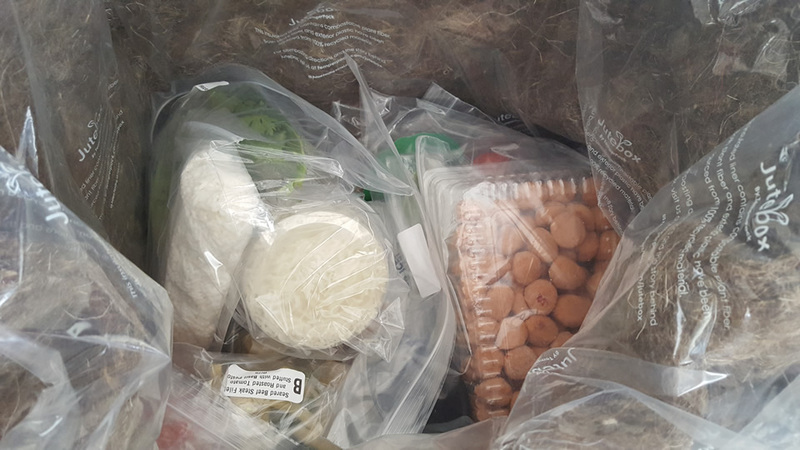 Dinner Kit B: Includes three dinner kits for four people (12 meals total per week). Starts at $11.95 per serving. Minimum order is four meals. If you order less than six meals per week, price is $13.95 per serving. Gobble’s recipes are extremely easy to complete – basically just adding to the pot and cooking. Therefore, we would rate them for the novice. Gobble is definitely new cook friendly and some of their recipes are family-friendly for sure. So, they would work for couples and families and they don’t require much cooking knowledge what-so-ever. That being said, if you’re more of a “foodie” type, you may find these recipes too simple, the instructions and prep a little lacking, and the flavors just so-so. 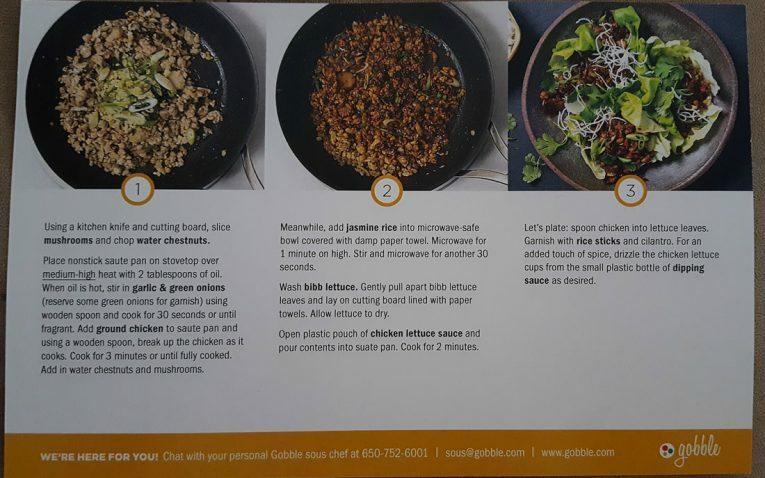 I would recommend Gobble for the busy couple or family that needs to get dinner on the table in just 10 minutes with as few dishes as possible. 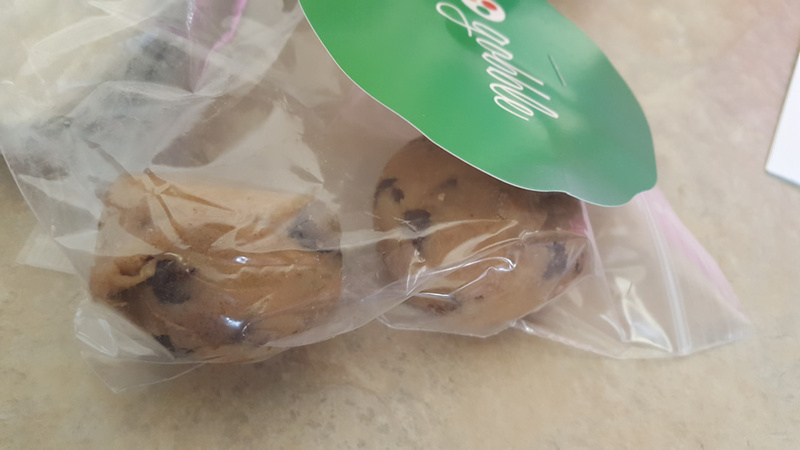 Free Cookie Dough: Not sure if it was because we were a first-time customer or they always send out cookie dough, but it was a nice surprise to receive four balls of cookie dough – which made some generously sized cookies. 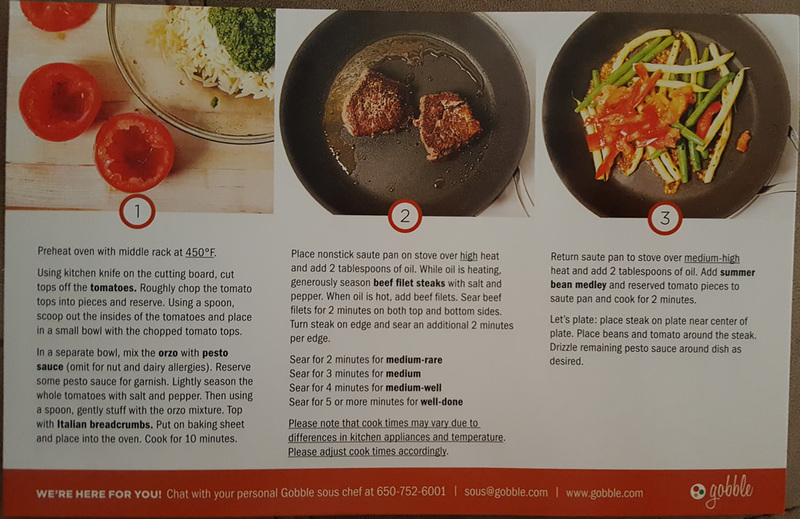 Neat Tips on Recipe Cards: Gobble uses every inch of their cards to teach you something. Each card has a neat little tidbit on it – telling you the origin of the item, history, etc. 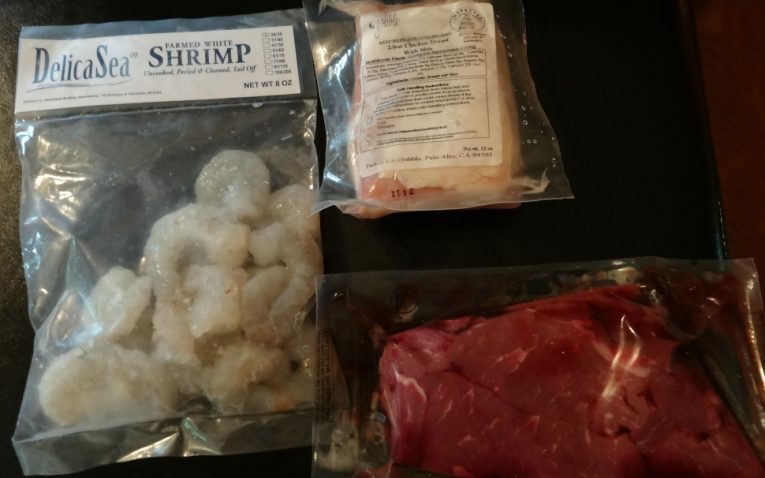 Meat Temperatures Included: Most of the recipes we’ve tested will just say cook the meat for a specific time. 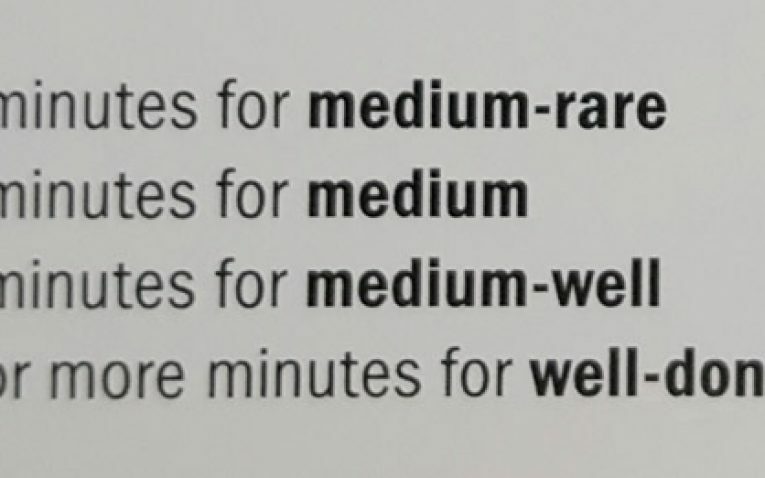 But Gobble takes it a step further and tells you how long to cook for rare, medium-rare, etc. This is great – especially if you have a preference. No Recipe Ingredient Amounts: Ingredients are just listed, but there are no amounts. So, if you wanted to go to the store and recreate this recipe at home, you can’t. 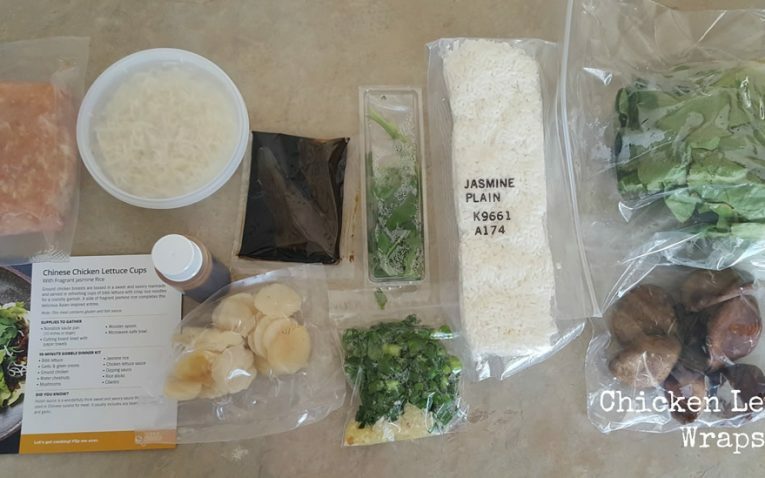 Most other meal kit delivery services give you the amounts right on the recipe card so you can remake them at home. Very Expensive Considering Flavor and Creativity: Gobble has one of the higher per serving prices out there – and when you consider the lack of complexity and flavor, I feel that they are way too overpriced. Portions Not as Generous: Most of the companies I’ve tested are for two people, but the portions are so generous, you could easily split it up. While this was the case on one of the recipes, the other two were fairly strict on the two servings. While Gobble has a great idea (10 minutes and just one pan), they are too simple and lacking in flavor. 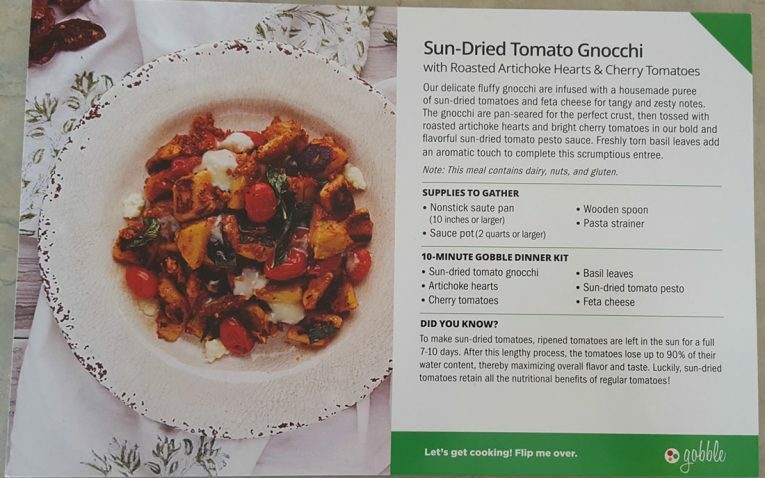 From receiving precooked ingredients that you are basically just reheating to some packaging issues, I would probably not use them again – especially with the high price point – but for those needing delicious 10 minute meals, no dishes and want to simplify meal planning (and cut grocery shopping), Gobble is the ideal solution. 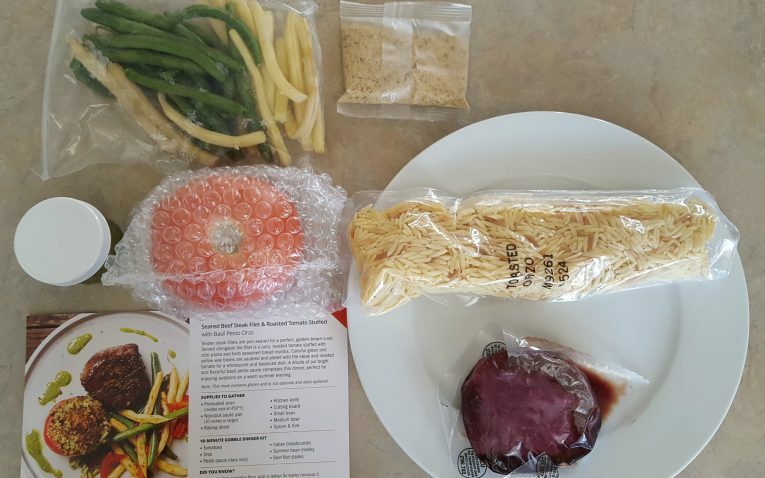 Easy 10-Minute Meals delivered weekly.